Packed with diagrams, illustrations and timelines, this accessible overview unlocks the storyline of the whole Bible. Ever wondered how the whole Bible fits together? Here is the help you need. This easy-to-read book has great diagrams that shows how God's promises unfold and how they apply to us - the way you read the Bible will never be quite the same again. This helpful book traces four aspects of God's promise to Abraham: a people who know God, a place of blessing, a King and a kingdom, and a blessing to the nations. By four quick journeys through the whole of the Bible, each chapter reinforces the perhaps familiar but clear outline of 'the story of the promise of salvation' given in the first chapter. Simple enough for someone new to biblical theology, but meaty enough for training others to teach an overview of the Bible's message fulfilled in Jesus. I've given copies to preachers and pastors I've trained in the Majority world, and will continue to do so. The concept of the Bible as story is a popular one these days. With the publication of The Jesus Storybook Bible, The Big Picture Story Bible, and others like it, parents and grandparents are seeing the cloud of confusion surrounding the cohesion of the Bible begin to lift as they read aloud. Books of this nature geared toward adults are getting attention. Graeme Goldsworthy’s book, According to Plan (written on this subject in 1991 before it was popular), is gaining a new audience and D.A. Carson’s The God Who is There comes at concept from a fresh angle by drawing the reading to think about his/her place in God’s story. 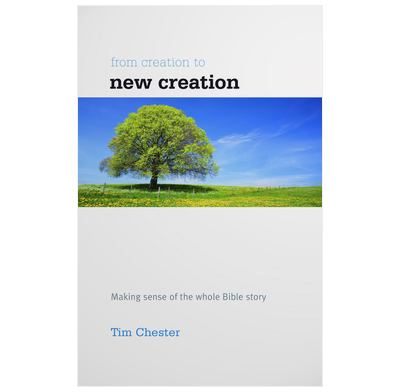 Of the books stacking up on the subject, few will have heard of Tim Chester’s From Creation to New Creation. This is an unfortunate reality, for it may well be the most useful one to date. What do I mean? While Carson’s book makes for an engaging read, sometimes leading one to forget he’s reading theology, Chester’s book reads more like a syllabus or a manual for understanding the storyline of the Bible. The strength of this approach is in its organization and search-ability. I enjoyed Carson’s book, but unless I can commit to reading it all the way through again, I’m not sure how often I’ll pick it up. This book, however, makes it easy to pop into a specific motif in the story and get the basic information you need without a lot of sifting. Chester follows the motifs of a people who know God, a place of blessing, a King and a kingdom, and blessing to the nations and brings them all together under the umbrella of God’s promise fulfilled in Christ. While not afraid to quote much Scripture, and often longer passages, Chester acts as a guide to the reader, making comments on important texts that highlight these different themes. As I did, many readers will also appreciate Chester’s helpful diagrams and his straight-forward, no fluff writing style, but there’s one thing that would have topped things off nicely: a conclusion that summarizes the content of the book and shows the cohesiveness of the story themes. The book ended a bit abruptly and I found myself craving a reminder. What I love about Chester’s book is that it’s great for getting the information. If you need information to be a bit more seasoned for the sake of palatability, you may want to choose another book like Carson’s. But for teachers who need user-friendly resources for study and anyone who appreciates simplicity and succinctness, I highly recommend it.